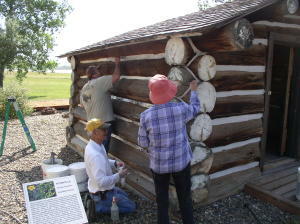 Volunteers help chink the Will James Cabins. The Big Horn County Historical Society and Museum gives back to the community each day it opens its doors. With your support, the Museum can continue this mission for now and for always. If you would like to become a member of the Big Horn County Historical Society and receive their quarterly newsletter, please complete the form below and send along with your check. Please print the form, fill it out and return it to BHCHS. Thank you. 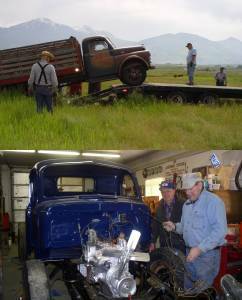 Volunteers restore and maintain the society’s extensive equipment collection. There are many volunteer opportunities available at the Big Horn County Historical Museum. Gift Shop – Do you enjoy retail? Could you assist with customers, operate a cash register and assist with inventory? Visitor Center – Do you enjoy greeting people and telling them about the State of Montana and our local area? Tour Guide – Do you like to talk about history? Guides are needed to share information about our museum and local history. Grounds – Do you enjoy yard work? The museum has 35 acres of grounds, which include manicured lawns and flower beds. There are many other volunteer opportunities at our museum. So whether you like to talk to others or work alone or whether you like to work inside or outside, we have a place for you. Training will be provided regardless of the volunteer activity that interests you. Please stop by our office and pick up a volunteer application.